IITA, SDN, HYPREP officials and the training participants. The IITA -Onne station, Rivers State, in partnership with Hydrocarbon Pollution Remediation Project (HYPREP) and Stakeholders Democracy Network (SDN) on 21 January flagged off the first batch of sustainable livelihood training for 17 youth in the fabrication of agroprocessing machines. The event, which took place at IITA-Onne, was attended by HYPREP and SDN officials including the HYPREP Project Coordinator, Marvin Dekil and representatives of SDN, Alexandra Sewell and Jesse Manufor. The Honorable Minister of Environment, Hassan Zarma, represented by the HYPREP Coordinator, who declared the training open, expressed his satisfaction at the quality of training the Ogoni youth and women were receiving and said he is confident that IITA will do a good job. Meanwhile, the training participants, who arrived a week earlier, were exposed to theoretical aspects such as the role of mechanization in agriculture, food processing and safety, entrepreneurship and record keeping, as well as precision measurement, mechanical efficiencies, safety and user friendliness, and coaching on how to work as a team. Makil explained that HYPREP is a government body responsible for implementing the clean-up of contaminated areas in Ogoniland, with the core mandate of provididing sustainable alternative livelihoods. He noted that this is the first batch of training participants to benefit from the livelihood training made possible under President Muhammadu Buhari’s administration thus urging them to exploit all available opportunities. Speaking to the participants, he said: “The skills you are to acquire within the next few months are in high demand and lucrative as well. I therefore urge you to give this training your utmost so you can benefit from it and justify the resources committed to it. Speaking at the ceremony, Sewell commended IITA for strengthening the livelihood options and for offering to train the participants on state-of-the art technologies. 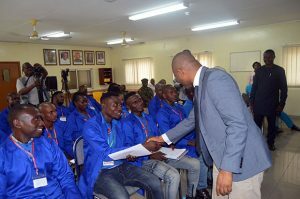 He encouraged the participants to stick to the training and learn modern methods that will add value to agricultural products as this will have a ripple effect on the secondary economy. He further said that at the end of the training, beneficiaries would have acquired welding skills and expertise on how to fabricate more processing machines, which is another potential economic opportunity. Head of IITA-Onne Station Richardson Okechukwu reiterated the core mandates of IITA, adding that the Institute is in the business of providing alternative sustainable livelihoods to resource-poor farmers as it has lifted millions from poverty. 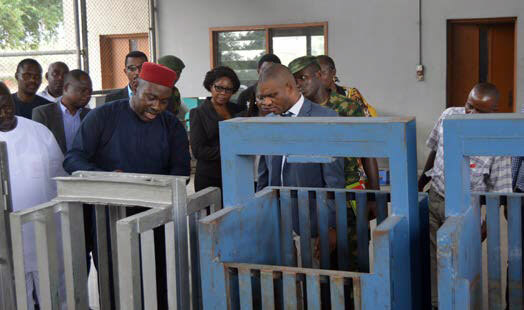 He stated that the key features will be to teach the Ogoni youth and women how to produce machines (attrition mill, sieving machine or sifter, cabinet dryer, peeling machine, press, graters, roaster) and inculcate the agribusiness mindset in them. Speaking on her expectations for the training, Lucky Sarah said she was elated to be one of the participants, stating that the training gives her hope for a better tomorrow. She said, “If it were food, I would say that the training is delicious,” adding that she expects to learn skills that she would, in turn, be able use to train others.